Ding Tai Fung Shanghai Dim Sum is located in a busy Markham strip mall 35-minutes drive from downtown Toronto - and it's well worth the trek. It's difficult to find good parking here and when you finally get to the restaurant, there is always a queue, especially on weekends. These inconveniences are almost certain, but for the exceptional food experience that's to follow, they are so very worth it. 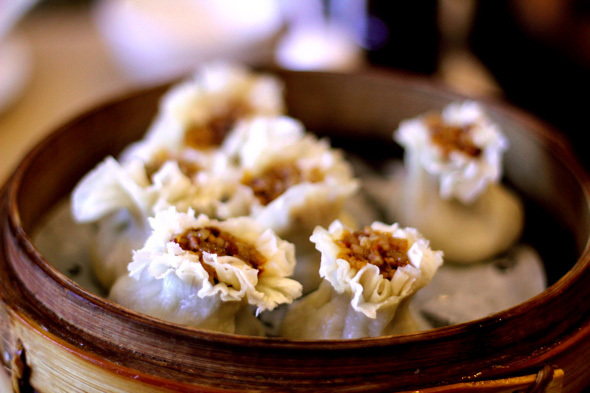 Ding Tai Fung is the only restaurant in the GTA specializing in Shanghai dim sum (also known as Xiaolongbao or "little basket buns"). 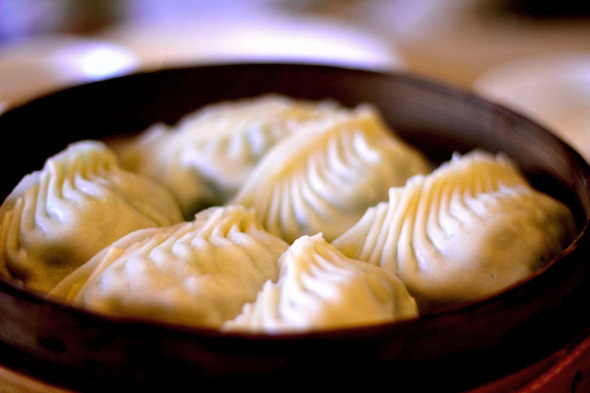 Differing from the widely available Cantonese-style dumplings and buns, the Shanghai variety is generally larger, brothier and focuses on a variety of fresh ingredients and big flavour. The restaurant is clean, austere and is clearly all about the food. Closely packed tables leave just enough space for the servers to squeeze in and out with the orders, while a bevy of cooks behind the counter rapidly prepare the dim sum for baking, steaming and frying. You wont see any dim sum carts at Ding Tai Fung, everything is ordered a la carte and made as it is ordered. Their menu, offering over 145 dishes, is as extensive as it is authentic, with their only other branch is located in Taiwan. It's obvious that the kitchen and wait staff are used to working at a high level of efficiency. Even at peak times, orders arrive in less than 10 minutes, patron turnover is brisk and the food and tea is always fresh. Our meal started with some piping hot Jasmine Tea and Steamed Chive and Meat Dumplings ($5.99). 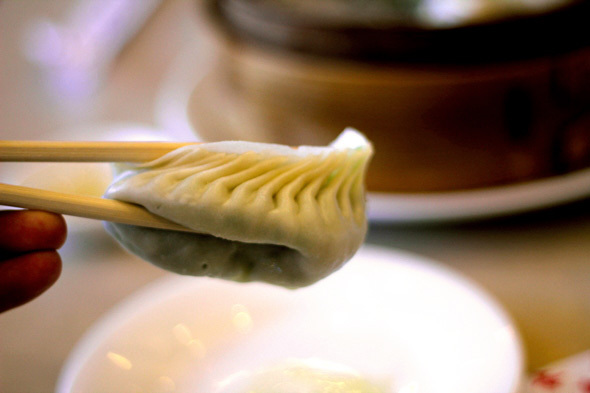 These large, crested dumplings are so big they require some effort to manage with chopsticks. If you can get one of these in your mouth, expect an explosion of succulence. Carefully mixed inside the dumpling with the garlic, chive and savoury beef is warm broth that adds another dimension of taste and texture. The skin is firm enough to hold the broth yet soft, without being soggy. Customers also have the option of ordering the very similar Steamed Vegetarian Dumplings ($5.99) which are equally delectable and are best eaten with the soup spoon so you don't lose any of the delicious broth. 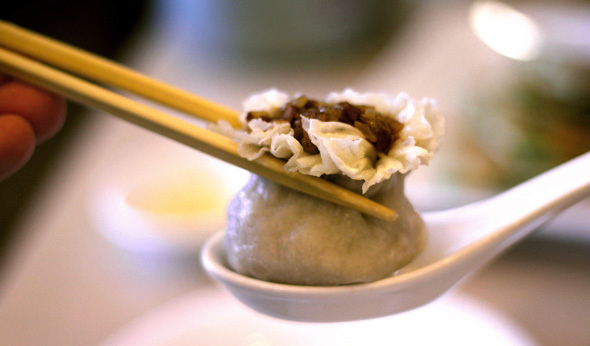 Up next were Sticky Rice and Meat Dumplings ($5.99) which are stuffed with glutinous rice and bits of stir-fried beef. These are partially open so you can see the grains if rice peeping out and are like a sweetish risotto in a thick wrapper. They're yummy, but rather heavy, so we ended up taking most of ours home. 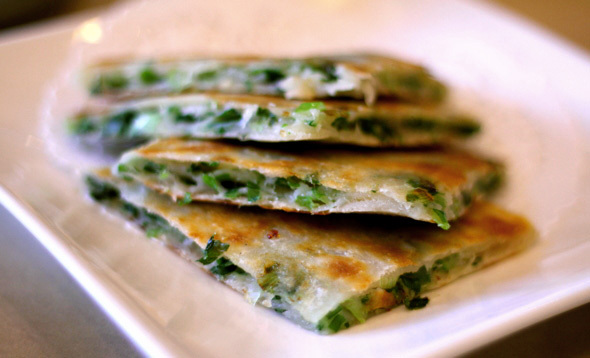 Another reason for making the trip up to Ding Tai Fung is to try their famed Green Onion Pancake ($3.49). Perfectly pan-toasted and firm on the outside yet soft on the inside, these large cakes are meals in themselves but were so good they were quickly consumed and definitely a must-try. 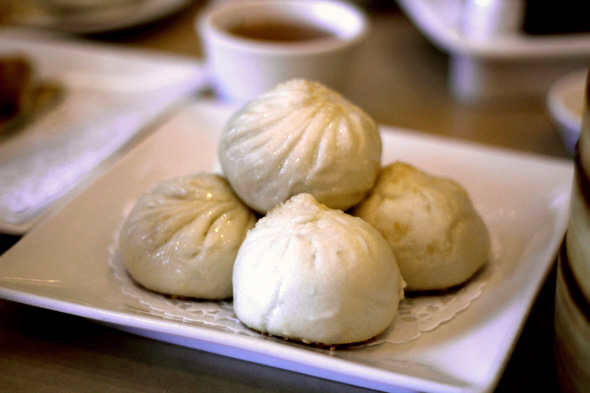 Shanghai-style Pan-Fried Minced Pork Buns ($5.99) look similar to white Cantonese style steamed buns but are rounder and their bottoms are pan-seared with sesame seeds; a nice touch. While these were tasty, we found that there was too much bread and not enough pork and filling inside. While the dim sum is served with slivers of ginger, the dishes are so full of flavour that they don't need to be dipped in soy sauce even though this, together with chili oil, is readily available at the table. For dessert, we had Steamed Sesame Paste buns ($5.50) which were simply sublime and unlike anything we have tasted before. We know dessert is customarily served cold but there's something heavenly about the warm gooey goodness of these toasted and steamed buns that is extremely satisfying and simply the best way to end an excellent meal. With its amazing flavours, consistent quality and wide variety of dishes, Ding Tai Fung is most definitely worth a visit and was, for us, a revelation in the richness and variety of flavours of Shanghai-style dim sum.